Finding the top of this route can be problematic. Hike up the Sentinel slabs until you are about 25 feet south of the Illusion Dweller top out. Look to your right and you will see where the top rope anchor should be set up. A wide-ish crack under an overlap. Plug in some 2.5" to 5" cams and triple up your extendo rope to the lip. Lay your TR rig out on the slab to skiers right of the climb and not in the top of the Rubberfat crack. The rope will jam and feed poorly if you run it down the crack. Rap into the route. Bring a full rope to use as an extendo runner to set up the top rope. Set cams in a flared overlap well back from the edge of the cliff. in a slot that takes 2.5" to 5" cams. This is really the only place for pro anyway. portable hold in all of Joshua Tree. This route is a neglected gem that rarely gets done. The line is a straight up shallow crack/trough/groove system with cryptic movement in the first half followed by straightforward but not necessarily easy offwidth and squeeze in the top half. The wide stuff up top thankfully features a handcrack in the back for a good bit of it. 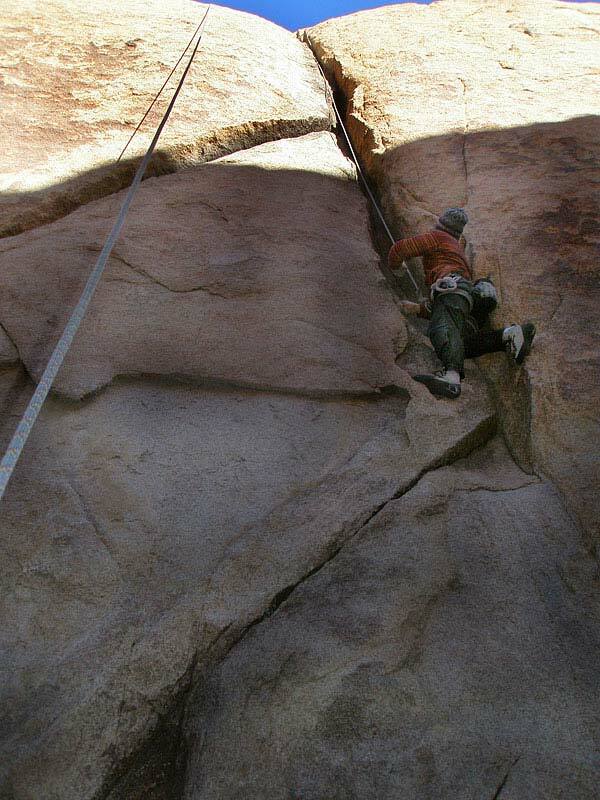 The crux is probably the entire first 30' of puzzling moves ending with a lieback on tenuous feet to gain a thank god horn/fin on the edge of the crack. Be extremely careful with the see-through flake/thread at the 10' level, outward force would liberate it from the wall. While next door there will be a 3 deep que for Illusion Dweller, you won't be waiting in line for this one.